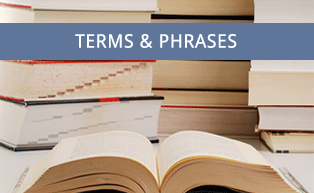 Terms and Phrases is the the Fidelity National Title glossary of definitions, meanings, and descriptions of significance for some of our industry's most often used terms and phrases. A Priori - From the past. From what goes before. Used in legal writing to indicate a cause and effect relationship. A.L.T.A. - American Land Title Association. Ab Initio - From the beginning. Ab Initio Mundi - From the beginning of the world. Abandonment - The surrender, relinquishment, disclaimer, or cession of property or of rights to property. Abatement - To put an end to. Abstract - A brief summary. Abstract Of Judgment - A brief transcript of the essentials of a judgment. Abstract Of Title - A summary of the conveyances, transfers and other facts appearing of record and relied upon as evidence of title to real property. Abutting - Touching or bordering a street, highway, or other public place. Acceleration Clause - A clause in a note, trust deed, or mortgage advancing or hastening the date of maturity of the indebtedness or obligation upon the happening of a certain event. Access Right - A landowner's right to have ingress to and egress from the property to a public street. Accession - Addition to property by natural increase or growth or by installation of improvements. Accommodation - An obligation assumed without consideration. Accommodation Party - A person who signs a promissory note without receiving value. Accommodation Recording - The recordation of an instrument without consideration and without assumption of responsibility for correctness or validity. Accretion - A process by which land on a shore or riverbank increases gradually by the deposit of sand or soil upon the shore or riverbank. Accrual - The growing or adding to. Acknowledgement - A written declaration by a person executing an instrument, given before an officer authorized to give an oath (usually a notary public), stating that the execution is of his own volition. Action - An ordinary proceeding in a court of justice by which one party prosecutes another for the enforcement or protection of a right; the redress or prevention of a wrong; or, the punishment of a public offense. Action in Personam - An action in which judgment is sought against a person. Action in Rem - An action in which judgment is sought against property to determine its status. Actual Notice - Notice in fact or in reality to or by a party directly and personally. Ad - At; to; before; near; for; of; until; within. Ad Curiam - Before the court; to the court. Ad Litem - During the pendency of the action or proceeding. Ad Valorem - According to value. Administrator - Person appointed by a court to take possession of property of a person who died without leaving a will, to pay debts and to distribute the property to those entitled to it according to law. Administratrix - A woman administrator. Advances - Money paid before proper time of payment. Adverse possession - Claim of ownership of property based upon open and hostile possession and occupancy. Affiant - A person who has made an affidavit. Affidavit - A written declaration under oath. Affirmation - A declaration in writing under penalty of perjury. After-Acquired Title - Title accepted by a grantor after his or her previous conveyance. Agency - A relationship between two or more persons whereby one is authorized to act for another. Agreement of Sale - An agreement entered into for the sale and purchase of property. Alcalde - Spanish for mayor or chief magistrate. Alienate - To transfer title to property. Alienation - The transfer of title to property. Alienation Clause - Provision in a note or in a security instrument calling for automatic maturity in the event of sale or transfer of title by borrower. All-Inclusive Deed of Trust - A deed of trust securing payment of an obligation owing under a prior deed of trust. Allegation - A statement of fact in a pleading yet to be proved. Alluvion - Soil deposited by the process of accretion. Amortization - Payment of principal and interest at stated periods for a stated time until debt is extinguished. Ancillary - An addition to. Ancillary Administration - Probate estate administration in a state other than the state of decedent's domicile. Annexation - Addition to property or to territory. Annuity - A yearly payment of money for life or for a term of years. Appearance - Presence of a party litigant before the court. Appraiser - A person qualified to determine property value. Appurtenance - Anything incidental to or belonging to land considered a part of the real property. Arbitrary (ARB) Map - A map made by a title company for its own convenience in identifying parcels of real property. Assessed Value - Value of property for taxation purposes. Assessments - Special taxes imposed to pay for public improvements beneficial to a limited area. Assessor - County official who determines value of property for taxation purposes. Assets - Property of value, property having an economic benefit. Assign - To transfer all of an interest in personal property. Assignee - One to whom property is assigned. Assignor - One who transfers property by assignment. Assumpsit - An undertaking to do an act or to make payment. Assumption Agreement - An agreement to undertake a debt or obligation contracted by another. Assumption Fee - The charge made by a lender when a buyer assumes seller's existing loan. Assumption of Mortgage - An agreement in which buyer agrees to be liable for payment of an existing note secured by a mortgage or deed of trust. Attachment - A judicial process by which a creditor obtains a lien upon property of a debtor prior to adjudication of the debt. Attestation Clause - The clause in a deed denoting the subscribing persons are witnesses. Attorn - To accept and acknowledge a new landlord. Attorney-In-Fact - An agent authorized to act for another. Avulsion - Sudden tearing away of land by violent action of a river or other watercourse. Ayuntamiento - Spanish for town council. Balloon Payment - Final installment payment of a promissory note larger than any single preceding installment payment. Bankruptcy - A proceeding in U.S. Bankruptcy Court wherein assets of a debtor (unable or unwilling to pay debts) are applied by an officer of the court in satisfaction of creditor claims. Base Lines - Imaginary east-west lines that intersect meridians to form a starting point for measurement of land. Bench Mark - Location indicated on a durable marker by a land surveyor. Beneficiary - One for whose benefit a trust is created. A lender secured by a deed of trust. Beneficiary's Demand - Payment required by a beneficiary under a deed of trust before authorizing reconveyance. Beneficiary's Statement - Statement of a beneficiary under a deed of trust as to principal balance due on a promissory note and other information concerning the loan. Benevolent Associations - Voluntary non-profit aggregations organized for the benefit of members. Bequeath - To give personal property by will. Betterment - Substantial improvement to real property. Binder - Written agreement to issue, within a specified time, a policy of title insurance. Contract to insure. Blanket Mortgage or Deed of Trust - A mortgage or deed of trust on more than one lot or parcel. Blue Sky Law - A law (generally of a state) protecting the public from investing in fraudulent companies. Usually requires full disclosure of risks associated with investment before the investment entity puts investor's monies at risk. Bona Fide Purchaser - A purchaser in good faith, for fair value and without notice of any adverse claim or right of third parties. Bond - A written undertaking to pay a certain sum of money. Bonded Debt - An indebtedness secured by a bond issue. Building Contract - Agreement for the construction of a proposed structure. Building Lines - Lines established by ordinance or by statute beyond which building is not permitted. By-Law - A rule adopted for the internal government of a corporation or unincorporated association. C.C.P. - Code of Civil Procedure. c.t.a. - With will annexed. Capita - The maximum which an adjustable rate mortgage may increase, regardless of index changes. Caption - The heading of a title or document. Cause - An action or a suit. Caveat - Let him/her beware. Caveat Emptor - Let the buyer beware. CC&Rs - Covenants, Conditions & Restrictions -- detailed limitations applying to the use or enjoyment of real property. Certificate of Sale - Evidence of a purchaser's acquisition of legal title at a judicial sale, subject to redemption rights, if any. Certificate of Title - Certified statement as to land ownership based upon examination of record title. Certiorari - A writ from a higher court to a lower court directing the forwarding of a certified record of a proceeding up for review. Cestui Que Trust - The person for whose benefit property is held in trust. Cestui Que Use - The person for whose use land was granted to another. Cestui Que Vie - The person for the duration of whose lifetime an estate has been granted. Chain of Title - A chronological list of documents comprising the record history of title to a specific parcel of real property. Change of Venue - The removal of a cause for trial from one county to another. Charter City - Generally, a city organized under a charter. Chattel - An item or article of personal property. Chattel Mortgage - Obsolete name for mortgage of personal property. Chattel Real - An interest in real estate which is of a lessor degree than a freehold estate. For example, an estate at sufferance. Chose in Action - A personal right not reduced to possession but recoverable by an action at law. Civil Law - Law of the Roman Empire, it is distinguished from the Common Law of England. Class Action - A lawsuit in which plaintiff represents himself or herself and all other persons similarly situated. Clearing House - An office where bankers daily settle the balance of their accounts with each other. Cloud on Title - A semblance or claim of title that is in fact invalid. Co-Administrator - One of two or more administrators. Co-Executor - One of two or more executors. Co-Insurance - Insurance issued by two or more insurers. Co-Trustee - One of two or more trustees. Code - A collection of laws. Codicil - A testamentary disposition subsequent to a will altering, explaining, adding to, subtracting from, or confirming it, but not revoking it. Collateral - Property pledged as security for a debt; also, indirect, when referenced to blood relationship as in 'collateral heirs'. Collateral Assignment - Transfer of an interest in personal property for security purposes. A collateral assignment is distinguished from an absolute assignment mainly because once the debt is paid that was secured by the collateral assignment, the assignment is extinguished. Color of Title - That giving the appearance of title. Commercial Acre - The portion of an acre of subdivided land remaining after deducting areas devoted to streets, sidewalks, etc. Commissioner's Deed - Deed executed by a court appointed person in consummation of a sale ordered by the court. Commitment - A pledge, promise, or firm agreement; also, a title insurer's contractual obligation to insure title to real property. Common Law - The unwritten body of English law founded upon customs and precedents. Community Property - Property acquired by a husband and wife, or either, during marriage, when not acquired as the separate property of either. Competent - Legally qualified, capable of contracting. Composition - Agreement between a debtor and creditors whereby the latter mutually agree to accept a certain percentage less than is due each one. Conclusive Presumption - Legal inference that cannot be contradicted. Condemnation - The taking of private property for a public use. The exercise of power of eminent domain. Condemnation Guarantee - An evidence of title issued to a governmental agency naming persons to be made defendants in an action in eminent domain. Condition - A qualification or restriction annexed to a conveyance of lands, whereby it is provided that upon the happening of a particular event an estate shall commence, be enlarged, or be defeated. Condition Precedent - A condition that must be fulfilled before a right accrues or an estate vests. Condition Subsequent - A condition that defeats a previously accrued right or vested estate. Conditional Sale Contract - Contract of sale where title remains in seller until all conditions of the contract have been fulfilled. Condominium - The composite of individual ownership and exclusive possession of a cube of space in a multi-unit building plus a collective ownership of and a collective right of possession to facilities common to all separately owned units. Confession of Judgment - Entry of judgment without formality of proceedings upon debtor's admission and with debtor's consent. Confirmation of Sale - Court approval of sale by a personal representative, guardian, or conservator. Congressional Grant - A grant of public land of the United States by an act of Congress. Conservatee - A person unable to manage self, property, or self and property and for whom the probate court has appointed a conservator. Conservator - A person appointed by probate court to take care of the person, property, or person and property of conservatee. Consideration - The value inducing another person to enter into a contract. Constituent Corporation - A corporation merged or consolidated with one or more other corporations. Constructive - Inferred or implied. Constructive Notice - Notice given by public records. Constructive Trust - Trust imposed by law to redress a wrong or to prevent unjust enrichment. Contiguous - In actual close contact; touching, adjacent, near. Contingent - Dependent upon an uncertain future event. Contingent Beneficiary - A person who may share in an estate or trust depending upon the happening of an event. Contingent Interest - An interest which may vest depending upon the happening of an event. Contour - Surface configuration of land. Contract - An agreement between two or more parties to do, or not to do a particular act. Contract of Sale - An agreement entered into for the sale and purchase of property. Convey - To transfer title to property from one person to another. Conveyance - A written instrument transferring title to or an interest in land. Corp. Code - Corporations Code. Corporate Seal - A seal attached to an instrument executed by a corporation. Corporation - An artificial being created by law and endowed with certain rights, privileges, and duties of natural persons. Corporation Sole - A corporation consisting of a single person and his/her successor in office. Corporeal Hereditaments - Substantial permanent objects which may be inherited. Corpus - Property comprising the assets of a trust. Cotenancy - Ownership by two or more persons. Courses and Distances - Description of land by metes and bounds. Covenant - Agreement or promise. Curtesy - The common law interest of a husband in estate of deceased wife. Custodia Legis - In the custody of the law. d.b.n. - Abbreviation for de bonis non administratis, De Bonis Non Administratis. Of the goods not administered. When an administrator is appointed to succeed another, who has left the estate partially unsettled, he is said to be granted "administration de bonis non;" that is, of the goods not already administered. McNair v. Howle, 123 S.C. 252, 116 S.E. 279, 285.
d.d. - Abbreviation for "days after date." D.S. - Abbreviation for "declaratory statement." Date Down - The date a title examination is to be brought down to from the date of the last examination. Generally the date of recording of instruments and documents in the Recorder's Office. De - From; of; concerning. De Facto - In fact. De jure - By right. Declaration of Homestead - A formal, written, recorded assertion by an owner that the dwelling in which he or she resides is exempt from forced sale. Declaration Of Trust - A written instrument by a person (settlor-trustor), acknowledging that he or she holds title to property (as trustee) for the benefit of another or others (beneficiary/ beneficiaries). Decree - A judgment by court. Dedication - Donation of land by owner for public use. Deed - Written document transferring title to land from one person to another. Deed In Lieu of Foreclosure - The deed purchased by the mortgagee from the mortgagor in lieu of the foreclosure of the mortgagee's mortgage. The mortgagor grants the title to the property secured by the mortgage to the mortgagee (lender) in lieu of lender foreclosing the mortgage. Deed of Sale - Evidence of a purchaser's acquisition of legal title at a judicial sale, subject to redemption rights, if any. Deed Of Trust - A three party security instrument conveying title to land as security for the performance of an obligation. Also called "trust deed." Default - Omission or failure to fulfill a duty, observe a promise, discharge an obligation, or perform an agreement. Default Judgment - A judgment against a defendant who made no appearance in court. Defeasance Clause - The provision of a mortgage giving the mortgagor the right to redeem the property upon satisfaction of the obligation it secures. Defeasible - Subject to being defeated, annulled, revoked. Deficiency Judgment - A personal judgment against the debtor for the amount remaining due after foreclosure of a security device, as in the case of a mortgage or trust deed. Demand - An escrow term describing the consideration exacted for a conveyance or for the relinquishment of an interest in or a right to property. Demise - A transfer of an estate for years, for life, or at will. Demurrer - The formal mode of disputing the sufficiency in law of an opponent's pleading. Deponent - A witness; an affiant. Deposition - Testimony of a witness taken upon interrogatories, not in open court. Depository Statement - Instructions accompanying the deposit of documents, instruments, or property. Deraign - To trace, to prove. Descent - Manner of succession to title to property of an intestate decedent. Description - Written instrument by which title to land is transferred to a trustee as security for repayment of a debt or performance of an obligation. Devise - The disposition of land by will. Devisee - A person to whom real property is given by will. Diluvian - The gradual washing away and loss of soil along the banks of a river. Divest - To deprive of a right or title to property. Documentary Transfer Tax - A tax on certain recorded transfers of title to real property. Domicile - Fixed and permanent home. Domiciliary Administrator - Administrator of estate of a decedent appointed by probate court of the state of decedent's domicile. Dominant Tenement - The land benefited by an appurtenant easement. Donee - Person to whom gift is made. Donor - Person who makes a gift. Dower - The common law interest of a wife in estate of deceased husband. Dragnet Clause - Provision in a security instrument making the security instrument applicable to all past and present obligations between debtor and creditor. Due-on-Sale Clause - Provision in a security instrument calling for automatic maturity in the event of sale or transfer of title by borrower. Earnest Money - Something given as a part of the purchase price to bind a bargain. Easement - A limited right or interest in the land of another entitling the holder to some use, privilege, or benefit. Easement Appurtenant - An easement created for the benefit of and attaching to a parcel of land. Easement in Gross - An easement created for the benefit of a person rather than for a parcel of land. Ejectment - Legal action for return of right to possession of land and for damages. Eminent Domain - The right to take private property for public use. Encroachment - The extension of an improvement onto land of another. Encumbrance - A right or interest in land decreasing its value but not hindering its sale or transfer. Endorsement - The act of signing a name on the back of a check or promissory note to evidence its transfer; also, a written document attached to an insurance policy expanding or limiting coverage. Enfeoff - To vest a person with fee title to land. Entirety - A form of cotenancy in which owners are jointly seized of the whole. Equitable Lien - A lien recognized in a court of equity. Equitable Title - The right to acquire legal title. Equity - Natural right or justice based upon ethics and morals. Equity in Property - The value of a person's interest in property over and above total liens and charges. Equity of Redemption - The right to redeem property after a judicial sale. Erosion - The gradual eating away of soil by natural forces. Escalator Clause - Provision for upward or downward adjustment of costs, expenses, rents, etc. Escheat - A forfeiture of title to the state. Escrow - A transaction in which an impartial third party acts upon instructions for both seller and buyer, or for both borrower and lender, in carrying out instructions, delivering papers and documents and, disbursing funds. Estate - The degree, quantity, nature, and extent of a person's interest in real property. Estate at Will - Possessory right of a tenant for an indefinite period terminable by either landlord or tenant upon notice. Estate for Life - Estate measured in time by the uncertain duration of a person's lifetime. Estate for Years - Estate measured for a certain, definite, or fixed period of time. Estate of Inheritance - An estate extending beyond the owner's lifetime which is succeeded to by heirs or by devisees. Estate Tax - A tax upon the privilege of transmitting title to property of a decedent. Estoppel - A bar to the assertion of a right or a defense in consequence of previous position, act, or representation. et Al. - And others. et Con. - And husband. et Seq. - And following. et Ux. - And wife. Ex Parte - A judicial proceeding, order, injunction is said to be ex parte when it is taken or granted at the request and for the benefit of one party only, and without notice to any person. Ex Post Facto - After the event. Examination - The process of determining the vesting of title, and encumbrances burdening land. Examiner - A person who analyzes a chain of title to land and expresses an opinion thereon. Exception - A deduction, subtraction, or exclusion. Exculpatory Clause - Provision designed to absolve a party from liability. Execution Proceedings - Judicial enforcement of a money judgment consummating in seizure and sale of debtor's property. Executor - A male representative of the estate of a testate decedent. Executory - An agreement or contract not yet performed. Executrix - A female representative of the estate of a testate decedent. Exemption - Immunity from a burden or obligation. Expediente - Spanish or Mexican land grant file. Extension Agreement - Agreement granting additional time for performance. Facsimile - An exact and precise copy. False Personation - Assuming, without authority, the identity of another person for fraudulent purposes. Fee - An estate of inheritance in real property. Fee Simple - Absolute ownership; a fee without limitation. Fee Simple Absolute - The largest recognized estate in land; a title without limitation or end. Fee Simple Defeasible - A fee simple estate subject to being defeated, annulled, or revoked. Feme Covert - A married woman. Feme Sole - An unmarried woman. Fictitious - False, feigned, pretended. Fictitious Deed of Trust - A recorded deed of trust containing general terms and provisions but naming no parties and describing no property; it is used for reference only. Fictitious Name - A name adopted for business purposes other than the true name of owner. Fiduciary - One who holds a position of trust and confidence requiring scrupulous good faith and candor. For example, a trustee of a trust is a fiduciary. Final Decree - A judicial decision finally disposing of a matter or cause. Financing Statement - A personal property security instrument replacing a chattel mortgage upon adoption of Uniform Commercial Code. Fissionable Material - Material capable of division into parts. Fixture - Property originally personal in character but intended to be a part of the real property to which affixed. Foreclosure - Enforcement of a lien by sale of property given as security. Foreclosure Sale - The sale of property given as security to secure performance of an obligation. Forfeiture - The loss of a right, title, or interest in property as consequence of a default under an obligation. Franchise - A special privilege conferred by government or, a contractual right to engage in a business under trade name owned by another. Freehold - An estate in land of uncertain duration. For example, a fee simple absolute or a life estate. Future Advance Clause - Provision for lender's future disbursements to be also secured by a security instrument previously executed. Future Interest - An estate in real property entitling owner to possession and enjoyment on a future date. For example, a remainder is a future interest. Garnishment - Attachment of personal property of a debtor in the possession of a third person. General Index - A title company's record of matters affecting title to land maintained according to names of individuals and entities rather than by real property description. General Plan Restrictions - Restrictions on use of real property imposed for the benefit of all lots within a subdivision. Gift - A voluntary conveyance or transfer of property without a valuable consideration. Gore - A small triangular piece of land. Gov. Code - Government Code. Graduated Lease - A lease providing for varying rental rates. Grant - A transfer of real property by deed. Grant Deed - A written instrument transferring title to real property. Grantee - The person acquiring title to real property by a deed. Grantor - The person transferring title to real property by a deed. Groin - A structure intended to impede or resist movements of sand adjacent to seas or lakes. Ground Lease - A lease of land only and not of improvements to be made by lessee. Ground Rent - Earnings of improved property credited to land separate from its improvements. Guarantee of Title - A form of title insurance based solely upon public record disclosures. Guardian - A person appointed by the probate court to care for the person, the property, or the person and property of a minor or an incompetent person. Habendum and Tenendum - To have and to hold. Habendum Clause - The provision in a deed, usually following the description, reciting: "to have and to hold, etc." Hand - A lineal measure of four inches. Heir - A person entitled by law to inherit property of a decedent. Hereditaments - Anything capable of being inherited. Holding Agreement - A form of a trust where trustee holds legal title to real property with no active duty of management or control. Holographic Will - A will entirely written, dated, and signed by the testator in his or her own handwriting. Homestead - The dwelling in which an owner or head of a family resides protected to a limited extent from forced sale by a recorded declaration of homestead. Hypothecate - To pledge without delivery of title or possession. (Principally an admiralty term that has found its way into real property finance). I/C - Individual/Corporation. An in-plant index of matters affecting persons or companies which cannot be entered on Lot Books because no specific properties are mentioned. Id Est. - That is commonly abbreviated "i.e." Idem Sonans - The doctrine that if two names may be sounded alike any variance in spelling is immaterial. Improved Real Estate - Land upon which buildings have been erected. In Essee - Alive; in being. In Personam - Against the person. In Propria Persona - In his/her own person; himself, herself. Abbreviated to "pro per." In Re - In the matter of. In Rem - Against property. Inchoate - Incomplete; not perfected. Incompetent - A person deemed by law incapable of managing his/her property. Incorporeal - Intangible; without physical existence. Indemnity - Compensation given for a loss sustained. Indemnity Agreement - An agreement relieving a person of an obligation to compensate for a potential loss. A hold harmless agreement. Indenture - A deed or other document executed by both parties. Inheritance Tax - A tax imposed upon the privilege of succeeding to the title of a decedent. Installment Land Sales Contract - An agreement entered into for the sale and purchase of property under which purchase price is paid in installments. Instrument - A formal, legal, written document. Insurable Interest - A sufficient interest in property that loss of it or damage to it would entail financial loss to the owner. Intangible - Incorporeal; not of material or physical existence. Inter Alia - Among other things. Interest - A share of, or a right to, or a concern in something of Value; also, a premium paid for the use of money. Interim Loan - A short term loan under circumstances anticipating a subsequent long term loan. Interlocutory Decree - A decree made pending final outcome of the cause prior to final hearing on the merits. Intestate - Without a will; also, a decedent who left no will. Inure - To serve to the use or benefit. Involuntary Lien - A lien created by operation of law. Ipso Facto - Of itself; by the very fact. Joinder - One or more person acting in unison joining together. Joint Protection Policy - A policy insuring more than one interest. I.E., the interest of both owner and lender. Joint Tenancy - A form of co-ownership by two or more persons in equal shares characterized by the incident of survivorship. Joint Venture - A form of business organization composed of two or more persons to conduct a single enterprise for profit. Judgment - A final determination in a court of competent jurisdiction of the rights of the parties to an action or proceeding. Judgment Lien - A statutory lien created by recording a judgment, or an abstract, ordering the payment of a sum of money. Junior Lien - A lien of inferior priority. Jurat - The portion of a certificate or affidavit stating when, where, and before whom it was sworn. Jurisdiction - The power to adjudicate concerning the subject matter in a given case. L.S. - Abbreviation for "locus sigilli" meaning the place for a seal. Laches - Inexcusable delay in asserting a right. Land Contract - An agreement entered into for the sale and purchase of land. Landowner's Royalty - An interest in unsevered oil and gas granted to a third person or reserved by a landowner on occasion of his/her alienation of an interest in real property. Lands, Tenements, Hereditaments - Inheritable lands or interests in them. Lateral Support - The support the soil gives to the land of an adjacent owner. Lease - A writing constituting a conveyance of real property form a term of years and a contract for its possession during that term. Leasehold - The term has come to be used as a technical difference from the equitable owner, and not as opposed to an illegal owner. The legal owner has title to the property, although the title may actually carry no rights to the property other than a lien. Legacy - A gift of personal property by will. Legal Description - A description of real property sufficient to locate it on the ground by reference to government surveys or approved recorded maps. Legatee - A person to whom personal property is given by will. Lessee - The person acquiring an estate for years in a lease. Lessor - The person transferring an estate for years in a lease. Letters of Administration - Formal written evidence of court appointment of a personal representative of the estate of an intestate decedent. Letters of Conservatorship - Formal written evidence of court appointment of a conservator of the person, or of the estate, or of the person and estate of a conservatee. Letters of Guardianship - Formal written evidence of court appointment of a guardian for the person, estate, or person and estate of a minor or of an incompetent. Letters of Testamentary - Formal written evidence of court appointment of a personal representative of the estate of a testate decedent. Levy - Seizure of property by judicial process. Lien - A charge upon property for the purpose of securing the payment or discharge of a debt or obligation. Life Beneficiary - A person entitled to receive a benefit for life. Life Estate - An estate measured in duration by the lifetime of a natural person. Limitations, Statutes of - Statutes limiting the time within which parties having a cause of action must institute proceedings to enforce the same. Lineal - In a direct line. Lis Pendens - A recorded notice of the pendency of an action. Lite Pendente - While the action is pending. Littoral - Pertaining to the shore. Living Trust - A trust becoming operative in the lifetime of the person creating it. Loan Policy - A policy of title insurance insuring the interest of a lender. Lock-In-Clause - A loan provision specifying a period during which no repayment is permitted. Loss Payable Clause - An endorsement to an insurance (fire) policy specifying parties (lenders) entitled to participate in proceeds in the event of loss. Lot Split - Ordinarily, sale of a portion of a parcel of land. Map Act - The Subdivision Map Act (Gov. Code, Section 66410 et seq.) regulating the subdivision of land. Marshaling - The ranking of several parcels of land for the satisfaction of a debt for which all parcels serve as security. Marshaling is an equitable principle. Mean High Tide Line - The average height of certain high waters. Meander - To follow a winding course. Mechanic's Lien - A statutory lien in favor of persons contributing labor, material, supplies, etc. to a work of improvement upon real property. Memorial - A short note, abstract, or memorandum. Merger of Title - The absorption of a lesser estate into a larger estate. Meridians - Imaginary north-south lines intersecting base lines to form a starting point for measurement of land. Metes and Bounds - Measurements and boundaries. Military Reservist Relief Act of 1991 - California statutory law to protect military reservists called to serve during the Gulf War from loss of property in satisfaction of obligations incurred before being called to serve. Monument - An object or mark employed by a surveyor to fix or to establish boundaries or land location. Moratorium - A temporary suspension by statute of the enforceability of a debt. Mortgage - A two party security instrument pledging land as security for the performance of an obligation. Mortgagee - The party entitled to performance by a mortgagor. Mortgagor - The party executing a mortgage. Muniments of Title - Deeds and other original documents comprising a chain of title to a parcel of real property. Mutual Water Company - A company organized for the purpose of providing water to its members. Naturalization - The conferring of rights of citizenship to a person who has been an alien. Naturalized Citizen - A person made a citizen of the United States by act of congress. Neap Tides - Tides occurring between the full moon and the change of the moon, twice every twenty-four hours. Negotiable - Capable of transfer by endorsement in the ordinary course of business. Negotiable Instrument - Instruments with special legal incidents permitting free circulation in commerce. Nominee - A person designated to act in the place and stead of another. Nonjudicial Foreclosure Sale - Sale of property pursuant to the power of sale provisions contained in a security instrument. Notarize - To prove execution of a document by means of a notary public's certificate of acknowledgment. Notary Public - A person authorized by law to take acknowledgments and to administer oaths. Note - A common reference to a promissory note. Note of Action - A lis pendens. Notice of Cessation - A recorded notice shortening the time for filing mechanics' liens if work ceases prior to completion. Notice of Completion - A notice recorded within ten days of completion of a work of improvement signaling commencement of the time period within which claims of mechanics' liens must be recorded. Notice of Default - A recorded notice of a trustor's failure to perform his/her obligation under a deed of trust. The beginning step in nonjudicial foreclosure of a deed of trust. Notice of Non-Responsibility - A recorded notice by an owner of real property that he/she will not be responsible for payment of costs of improvements contracted for thereon by some other person. Notice to Quit - Notice given by landlord to a tenant to pay rent within three days or vacate premises. Novation - The substitution of a new obligation for an old one. Nunc Pro Tune - Now for then; a tardy act made retroactive to the time when the act should have been done. Nuncupative Will - An oral will. Obiter Dictum - That said in passing. Office Information - Special information of title significance concerning persons or property maintained by a title company but not necessarily a matter of public record. Offset Statement - Statement customarily furnished an escrow holder as to the current status of rental accounts, security deposits, and balance due on liens and encumbrances. Omnibus Clause - Provision in an order for distribution by which any property of a decedent not specifically described is distributed. Open-End Mortgage - Provision in a mortgage (or deed of trust) by which additional advances of money made by lender to borrower after execution of the security instrument are also secured by it. Operative Property - Property reasonably necessary to the operation and conduct of a particular business. Option - A choice; a right, for a consideration, to do or not to do an act in the future, or to require or not require performance of a future act by another. Order Confirming Sale - A court order confirming sale of estate property by a personal representative, or other fiduciary. Ordinance - A legislative enactment of a city or county. Ostensible - That which is apparent or that which seems to be. Outlawed - A claim, right, or cause of action unenforceable due to lapse of time. Overriding Royalty - That interest in unsevered oil and gas retained by a lessee upon occasion of his or her execution of a sublease or assignment. Owner's Policy - A policy of title insurance insuring the title of an owner. Ownership - The right to use and enjoy property to the exclusion of others. Parcel - Any area of land contained within a single description. Partial Reconveyance - An instrument extinguishing the lien of a deed of trust from a portion of the property. Partial Release Clause - Provision in a land contract, deed of trust or mortgage for a conveyance of a portion of the property to buyer upon satisfaction of specified conditions. Participating Per Cent - Any interest in unsevered oil and gas which an owner, lessee, sublessee, or assignee disposes of to investors to finance production whereby the investor shares proportionately in the income from the enterprise. Partition Action - Judicial proceedings instituted by a co-owner or co-owners to sever their co-ownership either by a physical division into separate parcels or by sale of entire parcel and division of proceeds. Partnership - An association of two or more persons to carry on as co-owners a business for profit. Party Wall - A wall located on a boundary line and used by both owners. Patent - A conveyance of title to public land executed by the federal or state government. Pendente Lite - Pending litigation. Per Autre Vie - During the life of another. Per Capita - By the head; by the number of individuals. Per Se - By itself; as such. Per Stirpes - According to the roots; by right of representation. Percentage Lease - A lease under which rental is determined, in whole or in part, from the volume of business done. Periodic Tenancy - Tenancy for successive periods of equal duration. Personal Property - Movable property; property which is not real property. Plaintiff - The party initiating an action. Plat - A plot, map, or chart. Pleadings - The formal writing filed in court containing the various claims and defenses of plaintiff and of defendant. Pledge - Delivery of personal property as security for the performance of an obligation. Policy of Title Insurance - A contract indemnifying against loss resulting from a defect in title to the interest or lien in real property insured. Powers of Attorney - A written delegation from a principal authorizing another person, as agent of principal, to act for him or her in his/her name in a designated transaction or transactions. Pre-Payment Clause - Provision permitting payment of a debt prior to due date. Pre-Payment Penalty - Charge imposed by a lender for payment of a debt before due date. Preamble - The introductory portion. Preemption - The act of purchasing before or ahead of another person. Preemption Entry - An entry upon public lands of the United States by a settler giving the settler a preferred right to acquire title. Preemptive Right - A preferential right to purchase on same terms as offered by a third party. Prescription - A method of acquiring an easement by adverse use of another's property. Press Copy - A title company's copy of title insurance or information it has issued. Presumption - That which may be assumed without proof. Pretermit - To omit; to pass by. Prima Facie - Assumed correct until overcome by further proof. Principal - A party represented by an agent or the chief or foremost party in a particular transaction or the amount of a loan to be repaid exclusive of interest or the assets constituting a trust estate. Priority - The relative superiority of competing liens and encumbrances. Privity - Closeness; mutuality of relationship. Pro-Rata - Proportionately; according to a certain rate, percentage, or proportion. Probate - Relating to proof; the proof of validity of a will of a decedent; the proof of ownership. Probate Court - A division of superior court having jurisdiction over estates of decedents, minors, incompetents, and conservatees. Profit Prendre - A right to take a part of the soil or produce of land. Promissory Note - An unconditional written promise, signed by maker, to pay, absolutely, a sum certain in money, either to the bearer or to a person therein designated or his/her order. Public Lands - All unoccupied land belonging to the federal government subject to disposition under general land laws. Public Report - A report issued by California Real Estate Commissioner containing information of interest to a prospective buyer of subdivided property. Purchase Money Mortgage - A mortgage securing payment of all or a portion of the purchase price of real property. A purchase money mortgage can be a mortgage with 'first priority', 'second priority', 'third priority', etc. Quasi - As; as if; of similar nature. Quasi-Community Property - Property acquired by a married person while domiciled outside California which would have been community property if the acquiring spouse had been domiciled in California. Quasi-Contract - A contract implied by law; based on conduct. Quiet Title Action - The name of an action brought to establish a title to property or to remove a cloud on the title. Quitclaim Deed - A form of deed containing no warranties and conveying the current right, title and interest of the grantor, if any, to real property. Range - A column of townships running north and south in a row parallel to, and east or west of a principal meridian. Ratification - The adoption or approval of a previous unauthorized act. Real Property - Immovable property such as land, buildings, improvements, appurtenances, and air space. Rebuttable Presumption - A presumption that is not conclusive one which may be contradicted by evidence. Reconveyance - A document extinguishing the lien of a deed of trust and reconveying the title to the real property encumbered by the deed of trust to the trustor. Record - To incorporate into the public records of the County Recorder; also, the system of public records imparting constructive notice of title to claims, or interests, in real property. Recording - The act of filing documents for record in the office of the County Recorder. Redemption - The act of buying back property previously sold in judicial proceedings. Redemption Right - The right of a debtor to reacquire title to property formerly owned by him or her but sold through judicial process to satisfy his/her debts. Reformation Action - Proceedings instituted for the purpose of correcting mistakes in documents. Reinstatement - Restoring to the status occupied before a forfeiture. Release - A document extinguishing the lien of a mortgage, judgment, mechanic's lien, etc. ; also, a document absolving another of liability. Release Clause - Provision in a mortgage or deed of trust for the release of the lien from portions of the property. Reliction - The gradual recession of water from the usual watermark exposing dry land. Remainder - A future estate, other than a reversion, taking effect upon termination of a prior estate. Remainderman - The person who owns an estate in remainder. Remittitur - An appellate court's instruction and direction to the lower court in disposing of a matter appealed. Replevin - A form of action for the recovery of personal property. Request for Notice - Recorded request by anyone desiring written notice of the recording of a notice of default under a deed of trust or of the scheduling of a trustee's sale thereunder; also, recorded trust request of anyone desiring notice of the scheduling of an execution sale foreclosing the lien of a judgment; also, a request filed in probate proceedings by anyone desiring special notice of proceedings taken therein. Request for Reconveyance - Written instruction of a beneficiary under a deed of trust addressed to the trustee, acknowledging satisfaction of the secured obligation, and directing the trustee to extinguish the lien of the deed of trust and reconvey the property encumbered by the deed of trust. Rescission - The act of canceling or annulling the effect of a document. Reservation - A right or an interest retained by a grantor in a conveyance. Residuary Clause - The "catch all" or omnibus clause of a will directing distribution of any property not specifically bequeathed or devised. Residue - That portion of a decedent's estate remaining after payment of debts, taxes, and distribution of specific bequests and devises. Restraint on Transfer - An impediment or limitation on an owner's right to transfer title to property. Restrictions - Impediments, limitations, or prohibitions respecting use of real property imposed in deeds or in a declaration. Resulting Trust - A trust implied by law to prevent injustice. Revenue Stamps - Stamps affixed to documents evidencing payment of federal tax formerly imposed. Reversion - A presently vested future estate in the grantor or grantor's heirs the possession of which is deferred. Rider - A supplement to; an addition to; an endorsement to a document. Right of Survivorship - The right to succeed to the interest of a decedent. Right of Way - A right to pass over or to cross a parcel of land. Riparian - Pertaining to the bank of a river or stream. Riparian Rights - The rights of an owner to water bordering his or her land. Rood of Land - The fourth part of an acre in square measure, or one thousand two hundred and ten square yards. Rule Against Perpetuities - At Common Law, a principle which provides that no interest in real or personal property shall be good unless it must vest, if at all, not later than twenty-one years after some life in being at the creation of the interest. California has adopted a statutory modification of the rule. Sale and Leaseback - A transaction in which a grantee in a deed leases the same property back to the grantor without a change in its possession. Sales Contract - An agreement entered into for the sale and purchase of property. Satisfaction - The performance of the terms of an obligation. Scilicet - To wit, that is to say; namely, abbreviated as "ss." Seal - An impression on a document lending authenticity to its execution. Searcher - A title company employee who assembles the links required to complete a chain of title to real property. Section - A measure of land one square mile containing 640 acres. Security - Collateral; property pledged or hypothecated to secure performance of an obligation. Security Deposit - Deposit of money made to assure performance of an obligation. Seisin - The possession of land under a claim of freehold. Servient Tenement - The estate burdened by an easement. Servitude - A right in another's property in the nature of an easement. Settlor - One who creates a trust. Severalty Ownership - Ownership of property by one person sole ownership. Sheriff's Deed - Conveyance of title to a debtor's property as a consequence of an execution sale. Sine Qua Non - Without which not. An indispensable requisite. Situs - The location of property. Slander of Title - False unjustified statements regarding another person's title to property. Soldiers' and Sailors' Civil Relief Act - Federal law designed to protect members of the armed forces from loss of property in satisfaction of obligations incurred before entry into the service. [See also California's Military Reservist Relief Act of 1991]. Special Assessments - Charges imposed upon real property especially benefited by a local public improvement. Specific Performance Action - A form of action seeking the execution of documentation relating to real property. Stare Decisis - A form of action seeking the execution of documentation relating to real property. Statement of Information - A brief statement of facts relied on by title insurers to assist in the proper identification of persons. Status - The legal position of an individual; i.e., adult, minor, etc. Statute of Frauds - A series of statutes designed for the purpose of preventing fraud. For example, in order to be enforceable, an agreement for sale of real property must be in writing. Statute of Limitations - A series of statutes designed to render unenforceable stale claims and rights. Stirps - Stock, race, family. The person from whom a family descends. Stop Notice - A notice given a construction lender by an unpaid contributor to a work of improvement for the purpose of intercepting loan funds. Straight Note - A promissory note calling for payment of principal in one sum rather than in installments. Subdivision - The division of a tract of land into separate parcels. Subject To - The recognition of an existing lien or encumbrance but not assuming personal liability therefor. Sublease - A lease executed by a tenant for a term less than the leasehold. Subordinate - To make inferior in priority. Subordination Agreement - An agreement changing the priority of interests. Subrogate - To substitute one person in place of another with reference to an obligation. Substitution - The appointment of a person to act in the place and stead of another. Summons - A court's direction to the sheriff to inform a defendant that an action has been filed against him/her. Surety - One who guarantees the performance of an obligation by another. Survey - A process of measuring a parcel of land and ascertaining its area and boundaries. Syndicate - A pooling arrangement or association of persons investing in real property by buying shares in an organization. Takeout Loan - Agreement by a lender to place a long term (take out) loan on real property after completion of construction. Tax Deed - A deed issued to a purchaser following a sale necessitated by the nonpayment of real property taxes. Tax Sale - Sale conducted for the purpose of collecting delinquent taxes assessed to a parcel of real property. Tax Search - An examination of the public records of taxing authorities to determine the tax status of a parcel of real property. Tenancy by the Entirety - A form of co-ownership by husband and wife, characterized by the inability of one spouse alone to convey or encumber and by the incident of survivorship. Tenancy In Common - A form of co-ownership of property by two or more persons in undivided interests. Tender - An unconditional offer to pay a debt or to perform an obligation. Tenements - All rights in land passing with a conveyance thereof. Tentative Map - A proposed subdivision map required to be submitted to and approved by the local government agency before approval of a final subdivision map. Tenure - The mode or manner in which a title to land is held. Term - The time duration of a lease or of a loan also, any provision of a contract or lease. Terminable Interests - Interests enduring for a limited period of time. Termite Report - A report of an inspection for wood-destroying pests by a person licensed by the state. Testament - True declaration of a person's last will. Testamentary Trust - A trust created by the last will and testament of a decedent. Testator - One who died leaving a will. Testimonium Clause - The concluding clause of an instrument beginning with the words: "In witness whereof..."
Tie - A survey connection from a point of known position to a point whose position is desired. A tie is made to determine the position of a supplementary point whose position is desired for mapping or reference purposes, or to close a survey on a previously determined point. To "tie in" is to make such a connection. The point to which the connection is made is termed a tie point. Tie Point - Point of closure of a survey either on itself or on another survey. Tied - As used in surveying, monuments are tied together by measurements. A property corner is tied to offset monuments or to other property corners. Tier - A row of townships running east and west parallel to and north or south of a designated base line. Time Is Of The Essence - Clause in a contract indicating punctual compliance is required. Title - The sum total of a person's right or the extent of his/her interest in real property. Title Insurance - Assurance of indemnification for loss occasioned by defects in the title to real property or to an interest therein which is insured. Title Plant - The records of a title company assembled and maintained for the purpose of issuing title insurance on real property. Title Policy - A contract indemnifying against loss resulting from a defect in the title to the interest or lien in real property insured. Title Search - The assembled links required to complete a chain of title to a parcel of real property. Toll - To bar; to defeat. Toll the Statute - To stop or interrupt the running of a statute of limitation. Topography - The nature of surface of land, e.g., level, rolling, mountainous. Torrens - A system of registration of land title no longer lawful in California but utilized in some other states. Township - A normally square shaped subdivision of public lands containing 36 sections uniformly numbered starting with the northeast section. Tract - A parcel of land divided into smaller parcels called lots. Trade Fixtures - Articles of personal property, fastened to real property necessary to carry on a trade or business. Trade Name - The name under which an organization does business. Transfer Tax - A tax imposed upon transfers of title to real property. Trust - A fiduciary relationship in which a trustee holds title to property for the benefit of a beneficiary. Trust Deed - Same as a deed of trust; a three party security instrument conveying title to land as security for the performance of an obligation. Trustee - The fiduciary holding title to property for the benefit of another. Trustee's Deed - The deed given by the trustee under a deed of trust when the secured property is sold under power of sale. Trustee's Sale - Foreclosure sale conducted by the trustee in the exercise of a power of sale. Trustor - The person conveying property in trust. Ultra Vires - Beyond their powers. Undivided Interests - Unsegregated interests of co-owners in the entire property owned by them as tenants in common. Unities - The essential elements of a common law joint tenancy. i.e., unities of time, title, interest, and possession. Unjust Enrichment - Mistake or misfortune of one person unfairly benefiting another. Unlawful Detainer - An action brought for recovery of possession of real property. Usury - The exaction of a greater payment or return for the loan of money than is permitted by law. Valid - Sufficient in law; effective. Vara - A Mexican measure of length; approximately 33 inches. Variable Interest - Interest rates fluctuating up or down according to current cost of money. Vendee - A buyer or purchaser. Venue - The county in which an action is brought; also the place where an acknowledgment is taken. Verification - A sworn statement before a qualified officer (notary public) that the contents of a writing are true. Vest - To give an immediate fixed right to property. Vested Interest - A property interest that is fixed or determined. Vestee - Present record owner. Videlicet - To wit, that is to say; abbreviated as "viz." Viz. - Abbreviation for videlicet. Voidable - Subject to being declared void. Voluntary Lien - A lien intentionally created or entered into by a debtor. Waiver - The act of releasing or abandoning a right or a privilege. Warranty Deed - A deed containing express covenants as to good title and right to possession. Waste - Destruction or injury to real property. Water Right - The right of an owner of land to use water adjacent to or below the surface of the land. Wrap-Around Mortgage - Same as an "all inclusive mortgage": One incorporating the balance due under a prior mortgage. Zone - Area in a community designated for specified use and purpose. Zoning - Governmental regulation of the use of real property.